When I first heard that they were making live-action movie adaptation of The Sorcerer's Apprentice, I first wondered if this was going to become a Roger Rabbit kind of deal, but this time involving Mickey Mouse. But as more details were released, it appeared that I wouldn't be getting a fun little piece involve enchanted brooms but instead we were getting some Harry Potter wannabe invovling THE Nicolas Cage. And please, as much as it's hard to convey sarcasm over electronic media like this blog, but the use of capital letters up there is not praise. Nicolas Cage has been brutalizing movies ever since he demanded we "put the bunny down " (and then some) and to have him involved in a project is quite the omen of bad news. For a matter of perspective in terms of my previous movie reviews, he and Michael Bay deserve one another. Seriously. I had actually watched this movie on a whim sometime last year and was surprised I never got around to posting a review for it. Not that I particularly loved the movie enough to rush to post my feedback or anything. It's more along the lines of it being a waste of content if I don't take the time to write about, plus I also get to warn all of you away from losing 109 minutes of your life. Synopsis: The Sorcerer's Apprentice is a 2010 adventure movie produced by Jerry Bruckheimer, directed by Jon Turteltaub based on a screenplay by Matt Lopez, Lawrence Konner, and Mark Rosenthal. The movie is based around a segment of the 1940 animated Disney feature Fantasia that depicted the 1791 Johann Wolfgang von Goethe ballad. Back in our mythical past, legendary wizard Merlin (James A. Stephens) is betrayed by one of his apprentices, Maxim Horvath (Alfred Molina), who has allied himself with Morgana Le Fay (Alice Krige). 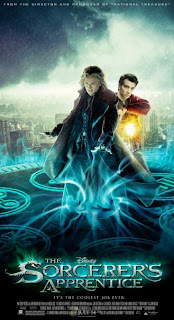 Merlin's remaining apprentices, Veronica Gorloisen (Monica Bellucci) and Balthazar Blake (Nicolas Cage) are too late to save Merlin but do manage to contain Morgana - inside Veronica. Balthazar then imprisons them both in the Grimhold, a magical artifact that manifests as a nesting doll. Balthazar now dedicates his life to capturing those sorcerers who seek to release Morgana from her prison while trying to find the Prime Merlinean - the one who is fated to be Merlin's successor. Fast forward to the year 2000 and a young Dave Stutler (Jake Cherry) has an encounter with the immortal Balthazar. Merlin's dragon ring eventually comes to life and essentially selects Dave as the Prime Merlinean. but Dave accidentally topples the Grimhold and releases Horvath, who again battles Balthazar until he imprisons both of them in another magical artifact. The urn will hold them in stasis for another 10 years and then the fate of the world will be determined as the two former apprentices will seek out the Grimhold and the Prime Merlinean. I can only say Prime Merlinean so many times before it begins to sound absolutely ridiculous. That happened sometime in the second paragraph of the synopsis, I think. The plot definitely came across as being overly convoluted for my comfort. This whole Prime Merlinean bent seemed like a lousy excuse to have a young protagonist for younger audiences to associate with, especially when he grows up to be the awkward physics student portrayed by Jay Baruchel. Maybe I'm being a bit too harsh, but his portrayal here did not strike me as the kind of a character that we'd find endearingly noble or something. Instead, he's really more of a pain to follow around and it really becomes hard to understand why he's fated to be true successor of the great and powerful Merlin. To be fair, the movie has a fair amount of fun CGI-fueled action sequences involving animated steel statues, shape-shifting cars and all that good stuff. Had we not been so distracted by the horrible acting tandem of Cage and Baruchel, the movie might have been mindless enough to just be enjoyed for all the pretty colors. But there were still there and quite well in the middle of all the action, thus making things even more difficult. I mean come one, did anyone buy into the concept of Nicolas Cage playing a formidable sorcerer who could wield magical powers just by waving his arms around? I didn't think so. I do feel bad for Alfred Molina, who just can't seem to catch a break in movies. He's clearly been typecast as a bad guy - and worse a slimy bad guy at that! Of everyone else in this movie, he seemed to have the most acting skills to bring to the table, which eventually seemed overdone in sheer contrast to everyone else. I'm not saying he's a great actor - everyone else was just that bad. I will never understand Jerry Bruckheimer's obsession with casting Nicolas Cage in his movies. Where they childhood friends? Are they somehow related by marriage? Is there some elaborate blackmail scheme going on in the background? It just puzzles me, really. The Sorcerer's Apprentice is yet another movie that did not need to be made. If anything, it seems to follow your classic formula for any studio trying to force a summer blockbuster - a formula that only results in hollow, empty movies. And so in the end I can only give this movie 1.5 nesting doll ensnared Morganians out of a possible 5.